1. Install TO3000 using the "Install an empty database" option when prompted. This will be your Database 1. 2. 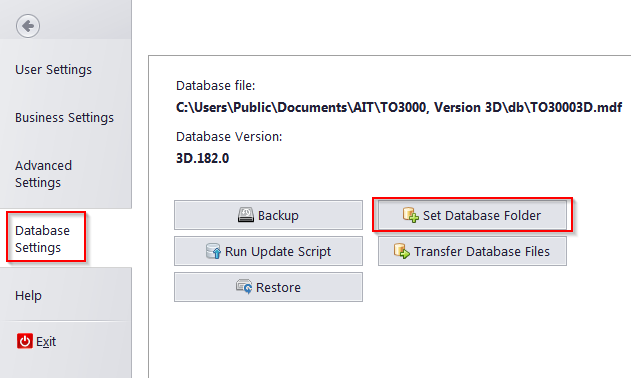 Move your database from "C:\Users\Public\Documents\AIT\TO3000, Version 3D\db" into another folder. This new folder will be your Database 1 location. 3. Install TO3000 once again using the same "Install an empty database" option when prompted. 4. Now you have your Database 2 installed and active and the folder "C:\Users\Public\Documents\AIT\TO3000, Version 3D\db" is your Database 2 location. 5. You can switch between your databases using Database Settings > Set Database Folder. In the window appeared you can select your Database 1 location or Database 2 location. Does this mean that you cannot use TO3000 in your laptop, because your license has been used in these 2 instances of the program?